Stylish lunch bag for woman. 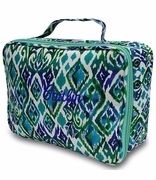 A super cool color makes this lunch box stand out from the crowd. Apple green is different, fresh and fun, ideal for carrying your lunch to work or to the sports day. This sturdy bag offers a main compartment with a double zipper for ease of opening and closing. Interior contains a lock food container, size 6.5" x 5" with upper removable velcro shelf. and mesh wall pocket. Slip-in front pocket is ideal for storing smaller items like a mobile phone or car keys. The bag is beautifully crafted with decorative stitching and vegan piping on the seams. Carry by hand using the top grab-and-go handle or with the long adjustable shoulder strap. Available with single monogram only. Great gift idea! Lunch bag measures 8.5" x 8.25" x 6". Vegan leather trim and PEVA lining.